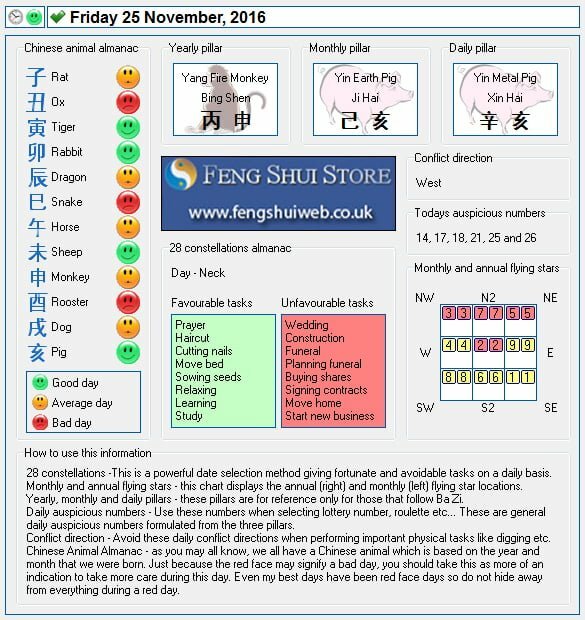 Here is the Free Feng Shui Tong Shu Almanac for Friday 25th November 2016. Hi Daniel, I had sent the following questions to your web support address because I couldn’t successfully register my account online (I do not know how to draw a line over the Captcha code). Much obliged to your reply! Is building no. 74 and Apt no. 406 unlucky for me? I’m a water dragon born on the 14th night of the 8th moon. In my life, I have lived in dwellings with the following nos: 31, 500, 347, 708, 2018, 5260…and they have all done pretty well for me. Would I botch it up by buying this retirement condo which bears 74 building address and Apt no. 406? (Not to mention a potential purchase contract date of 11/24/16!). Please help. I do not think it is that bad at all and if it were with you born on the 14th night that has served you well by the sound of it. The numbers combined are good and there is no need to worry.